Peaks of Otter Campground. It’s right next to a secondary highway but there was not much traffic and it was rather quiet at night when there was practically no traffic. ACCESS: Roads to and within the campground are paved but within the campground things are a little on the narrow side. There is one handicap accessible sites in the T loop, the Trailer loop. MAXIMUM RIG SIZE: Consult the Recreation.gov page. TENTS: Yes, but on tent pads only and only one per site although I saw both of these rules being broken. I’m not sure if there are any tent pads in the T loop. No Service. I could only get service with my booster. Sharptop Mountain over Abbot Lake from Peaks of Otter Lodge. BUGS: There were bugs but I didn’t find them annoying when I was there in late May. 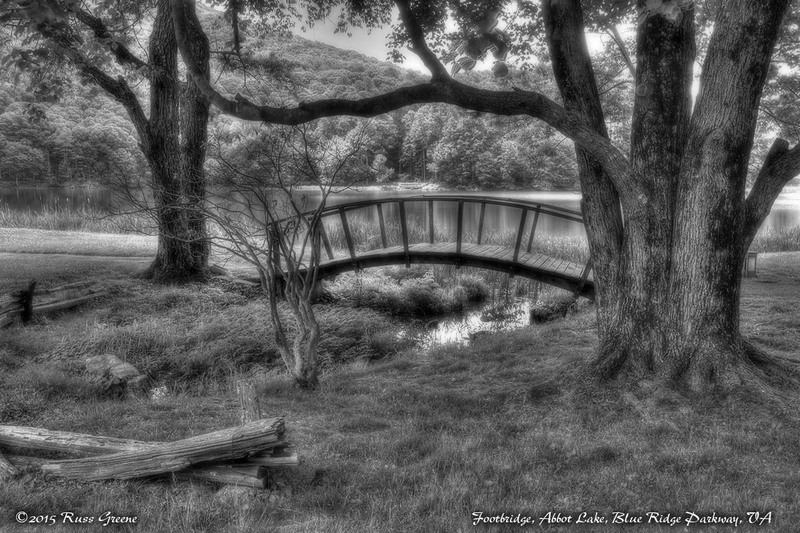 This scene was captured at the lodge at Abbot Lake near Peaks of Otter Campground. When I called ahead to the campground to ask what my chances were of snagging a spot if I showed up in the mid afternoon that day the voice on the other end of the line said “I think you’ll probably be OK”. Turns out this was something of an understatement as there were maybe 3 or 4 other rigs in the RV loop with most all of the sites empty. They remained that way throughout my two day stay. Note, however, I showed up on a Wednesday and Peaks of Otter as well as other NPS campsites along the Blue Ridge Parkway (BRP) can get pretty full on weekends and holidays. Someone at the Asheville Visitor Center told me the BRP campgrounds never fill up completely. 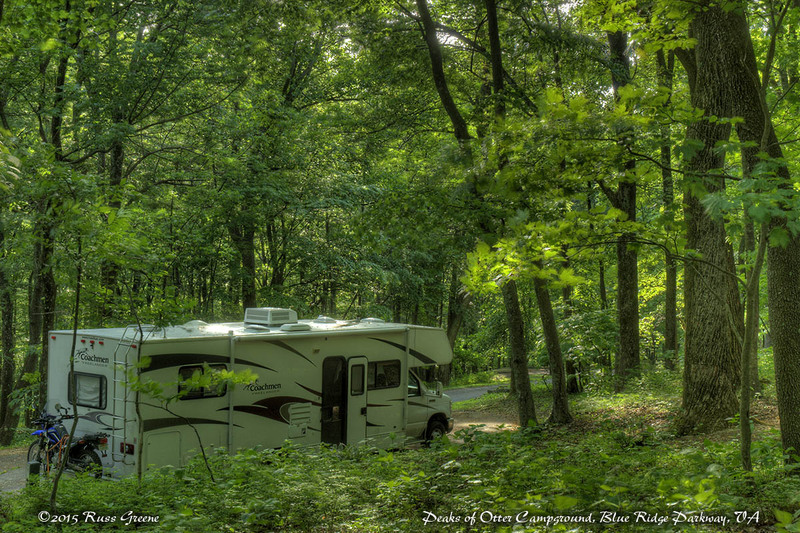 Some sites are held for first-come-first-served here and in the other BRP NPS campgrounds as well. Peaks of Otter Campground along the BlueRidge Parkway, VA. Like the other campgrounds along the BRP at which I stayed this one was a bit on the tilty side. Peaks of Otter is so named because… well, nobody is really sure. Some of the speculations are mentioned at the exhibit in the NPS Visitor Center just across the BRP from the campground. This exhibit chronicles some of the history of the area and informs about the flora and fauna. 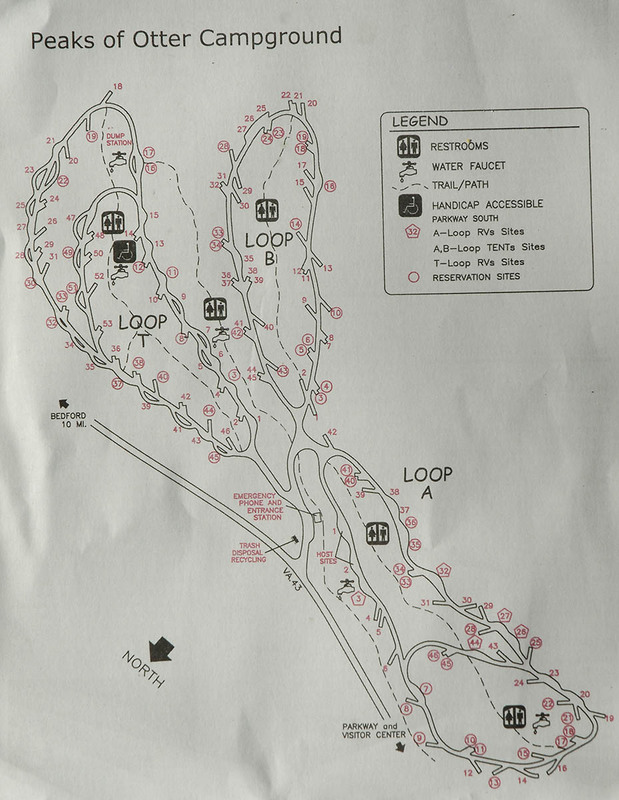 The campground has three loops, cleverly named A. B and… T. I bet you thought I was going to say C, didn’t you? T in this case stands for Trailer. 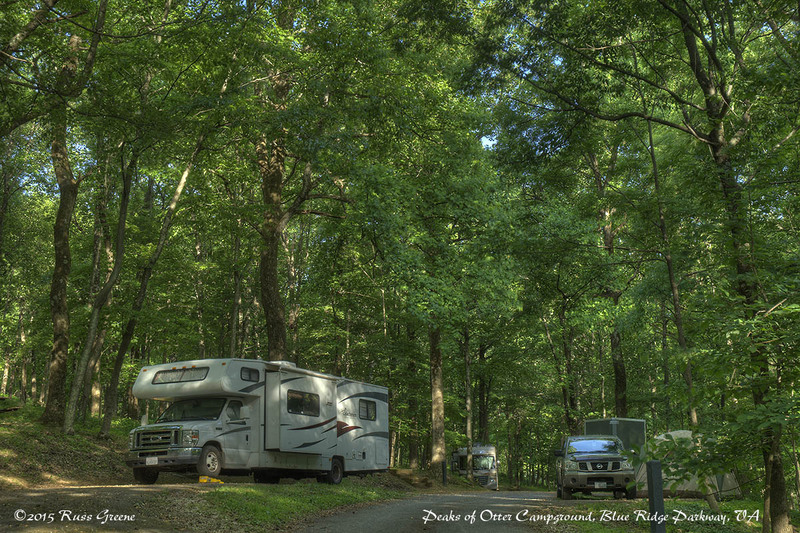 Peaks of Otter, like the other NPS campgrounds on the BRP appears to be older, so the campsites tend to be smaller. I got my 30′ Class C into one of the larger sites, a pullout, T 7. Parked at the extreme end of the site with my rear bumper close to the campground road in order to enable leveling, which BTW was a bit of a pain, there was plenty of room for a car in the site as well. A larger rig and car could have fit in terms of the length of the site but because of its slope… well, I’m not sure how that would effect leveling a larger rig or one with an hydraulic system. I use those stupid plastic leveling blocks. The campground is on a hillside and sites tend to be tilty, or if you prefer I can use a real word–hillsidey. Hah! For those with solar panels, don’t expect to get much if any benefit from them here as the campground is nestled in a forest of large deciduous trees. Sunshine it spotty. Another way of saying this is that there is a lot of shade. Although the campground is a little bit of a distance from the BRP and noise from that road wasn’t observed it is right alongside highway 43 and road noise from that thoroughfare was plainly audible and traffic was visible as well. It’s a two lane country road and there wasn’t much traffic–it could be minutes between vehicles–especially at night. I didn’t find it bothersome. To my absolute delight and childlike glee I saw something as I strolled around Abbott Lake by the nearby Peaks of Otter Lodge that I can’t recall seeing since I was a child: fireflies! If you haven’t ever seen them these wonderful little bugs carry their own miniature strobe lights around with them and flash them periodically as they fly around in the evenings. As children we used to catch them and put them in glass jars and marvel at their ability to light themselves up, but by the time I was a teen they were no longer to be found in the neighborhood where I grew up. As I walked back to the campground from the lodge one evening I saw a tiny little pinprick of light in the near distance. Then another, and another, and as I turned to look around I saw dozens of periodic flashes all around me, maybe hundreds. I was beside myself with joy. A tear came to my eyes as I called out aloud “Hello fireflies! Hello to all of you. I’m so very happy to see you, each and every one!” They made the child in me so happy. It’s good to know they’re still around in places. The Peaks of Otter Lodge is about .3-.4 miles away. A trail leads from the campground, jumps across route 43 and goes down a slight grade through the woods to the lake shore where a paved path takes you the rest of the way. Alternatively, a trail leaves from the Visitor Center taking a different route about the same length. At the lodge one can find a bar and a restaurant, and of course rooms. I saw a sign that said RV Overflow Parking so obviously there is parking for RVs. I walked down there a couple times to use the WiFi but it wasn’t working properly and wasn’t really usable. The second time I was there the facility manager said they had somebody working on it. A path leads around the lake and makes for a leisurely stroll of maybe 30 minutes or so. No boating or swimming is allowed at the lake. 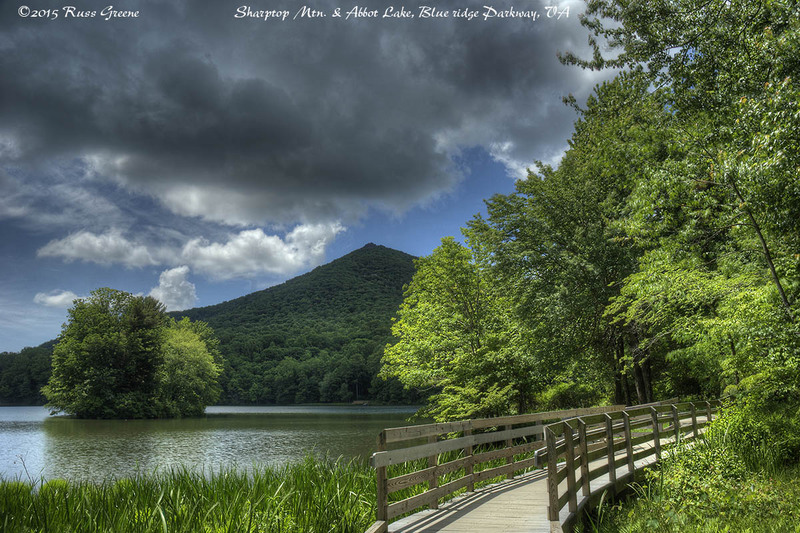 Seven area trails in all are described in the Blue Ridge Parkway Outdoor Guide available free at BRP Visitor Centers. One of these trails goes up to the Johnson Farm where living history demonstrations are available on a seasonal basis. On the same side of the BRP as the campground is the NPS Nature Center. It had been closed for some number of years but was being readied to reopen when I was there. Fireflies fill my yard each night . Beautiful sight as you saw on BRP. On my bucket list is the Synchronous Fireflies Event in Elkmont TN every June in the Great Smoky Mountains. For info go to: http://www.heysmokies.com/synchronous-fireflies-in-great-smoky-mountains-june-2016/. Apparently it takes a bit of advance planning – like 6 months! Seems like the fireworks display of your lifetime, though! Oh yeah, thanks for mentioning that. I heard about that somewhere before. Sounds terrific… all the fireflies flashing in sync. Amazing. 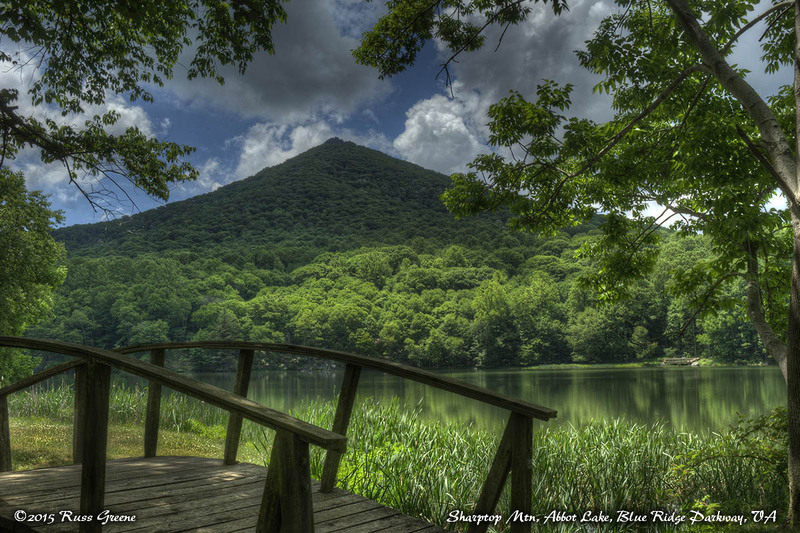 I really like the shot of Sharptop Mountain over Abbot Lake. I totally agree on your sentiments on the wonder of fireflies. Yeah, fireflies are just magical, sweet little bugs.